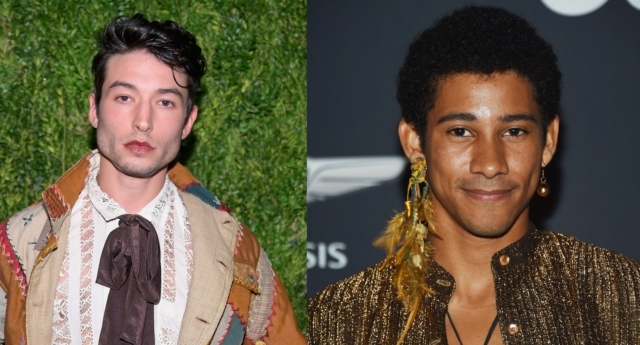 Queer actors Ezra Miller and Keiynan Lonsdale are posing in dresses in a new Vogue shoot ahead of the Met Gala. The Fantastic Beasts and Love, Simon stars are showing everyone how it’s done ahead of the “Camp: Notes on Fashion” themed Met Gala, which takes place at New York’s Metropolitan Museum of Art on May 6. In the Vogue shoot published on Tuesday, the two actors are serving camp opulence in contrasting black-and-white outfits. Lonsdale donned a black tuxedo-style “trompe l’oeil dress by Thom Browne”, posing seductively opposite Ezra Miller in a white lace gown. Of course, Ezra Miller doesn’t need an official camp theme to pull off eye-catching queer runway looks, with the actor regularly grabbing attention at film premieres with high-fashion looks. The Metropolitan Museum of Art announced the camp theme in October—a reference to American author’s Susan Sontag’s 58-page essay Notes on ‘Camp,’ published in 1964. The gala will be chaired as usual by Vogue editor-in-chief Anna Wintour, who will be joined by singer Harry Styles, performer Lady Gaga and tennis champion Serena Williams as co-chairs. Costume Institute curator Andrew Bolton said the theme perfectly match the current socio-political moment. “We are going through an extreme camp moment, and it felt very relevant to the cultural conversation to look at what is often dismissed as empty frivolity but can be actually a very sophisticated and powerful political tool, especially for marginalised cultures,” he said, quoted in the New York Times. “Whether it’s pop camp, queer camp, high camp or political camp—Trump is a very camp figure—I think it’s very timely,” he added.